I climbed Aconcagua by solo on Desember 2005. 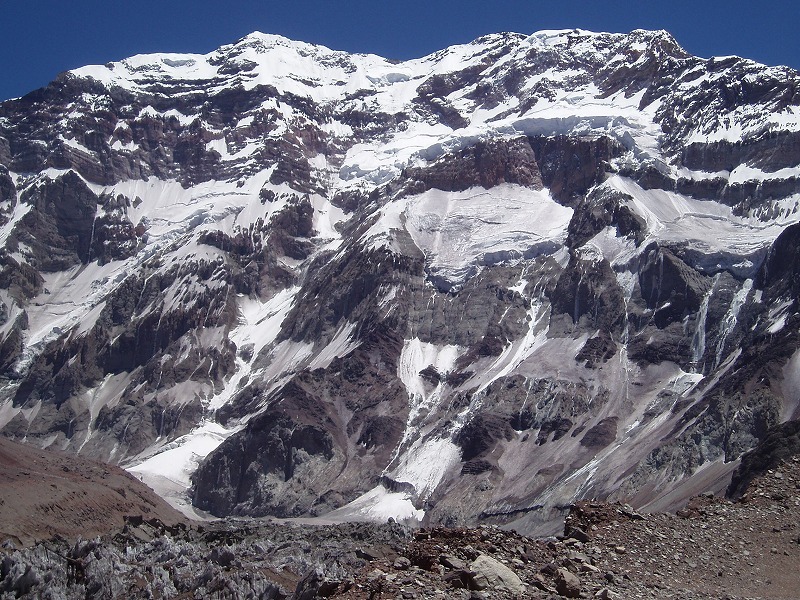 Aconcagua is the highest mountain in South American, at 6,960.8 m (22,837 ft). Following is a my climbing record of Aconcagua. Dec. 10 Toronto, Canada ~ Santiago,Chile 10:30 Stay at hotel in Santiago. Dec. 11 Santiago, Chile 9:30 by bus ~ Mendoza, Argentina 16:30. Ms.Susana from the guest house Aconcagua pick me up. Dec. 12 Obtain climbing permition. Go shopping. Dec. 16 Make a round trip to Plaza Francia of south wall for high altitude acclimatization. Confluencia 9:00 ~ Plaza Francia 15:30 ~ Confluencia 18:30. South wall of Aconcagua is great! Dec. 17 Stay at Confluencia. Dec. 18 Confluencia 8:30 ~ Plaza de Mulas (4,370m/14,340ft): Base camp 19:30. It takes 11 hours. Dec. 19 Stay Plaza de Mulas : BC. Dec. 20 Stay Plaza de Mulas : BC. Writing pstcard at the hotel which is located 20 minutes from the BC. Dec. 22 Stay Plaza de Mulas : BC. Dec. 23 Go up! BC12:00 ~ C1 18:00. Nido de Cóndores : C1 was very windy. When I was assembling my tent while struggling by strong winds, park rangers helped me. Dec. 24 C110:30 ~ Camp Berlín (5,940m/19,490ft): Camp2 13:30. The classic high camp, offering reasonable wind protection. C2 is more comfortable than C1 because it is not windy. Dec. 25 C2 6:30 ~ Summit (6,960.8m/22,837ft)16:00 ~ C2 20:00. For climbing time 9 hours and 30 minutes. Total time 13 hours and 30 minutes. I felt a tremendous sleepiness during the descent, so I rested by lying down about 30 minutes in the Independencia hut (6350m) which is located above C2. However, Independencia hut is seldom used and offer little protection. I met Mr.Yamamoto who survived in the 2004 accident of Annapurna in Himalaya. But he did missing in avalanche in Dhaulagiri (8167m) on September 28, 2010. We talked a lot with forget the time in the magnificent scenery. It is a wonderful memory for me. Dec. 27 Stay Plaza de Mulas : BC. Dec. 28 Stay Plaza de Mulas : BC. My face edema not getting better, that why I decided to descent. Dec. 29 Go down to Puente del Inca (2,740m/8,990ft): A small village on the main road, with facilities including a lodge by horse. I was getting dear to the horse, because the horse which put me walked the trail of very stony. Dec. 31 After sightseeing Mendoza, I moved to Chile, and flew to Easter Island (Spanish: Isla de Pascua). And I finally got back to Japan in January 14 2006. “Why am I here?” I wondered looking at the ceiling of a room in a guest house in Aconcagua. One month before departure, I suddenly thought about climbing Aconcagua, and arranged air tickets and came here without doing much preparation or training. October 2005, I finished the first anniversary of my husband’s death. Having no family, I could not think of anything else than climbing mountains as my objective of life. The list of my climbs begins with Mount Fuji at the age of 20. It was an excursion trip of my work place. After that, just like many mountaineers do, I spent all my time climbing and traversing mountains which are not snowy. When I was 23 years old, I joined a local mountaineering club, and started climbing in the winter. Since then, my mountain climbing was “climbing and scrambling.” I was so much attracted to rock climbing, which is thrilling and exciting, delicate and refreshing. I seldom walked mountain ridge trails. Making summit didn’t interest me. So, it didn’t make sense to me to spend a lot of time and money on climbing mountains just for high altitude. The reason why I stayed away from high altitude mountains was not just because I liked rock climbing. I had experienced a harmful effect of large expeditions in the past. In 1989, my husband and I joined an expedition to climb Manaslu, as 8,000er. I wanted to know what a high altitude mountain is like as it was something my husband was doing. Also, I wanted to climb a Himalaya mountain myself, as a person staying, although marginally, in the circle of serious mountaineers. Those are the two reasons why I joined the expedition. Together, we paid close to 2 million yen for an expense. However, I gained very little from this experience, for what I paid. I was forced to adapt myself to the expedition style of climbing. Hierarchical society where the chief of expedition makes decisions for the entire group, and acting in the same way in every aspect reduced the joy of mountaineering. I felt it was not my style of climbing. Since then I involved myself in climbing big walls in Europe and the United States. 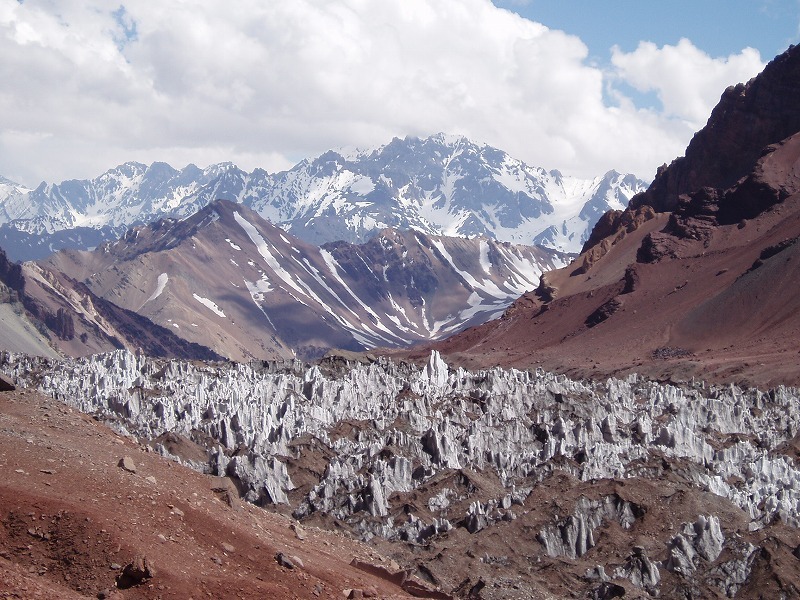 Why now, have I come to climb Aconcagua? To find out the attraction of high altitude mountain climbing for which my husband risked his life? Maybe I was looking for a place to die, while wandering the area where my husband left his trace. I did not know what was driving me. Mr. Kin’ichi Yamamori from Japan Himalaya Association commented that recent high altitude mountain climbing is a mixture of high altitude climbing and high altitude “hiking”. According to him, a guided high altitude mountain tour with all the personal equipment carried by porters is a high altitude “hiking”. Although it’s been 16 years since I climbed a high altitude mountain last time, I wanted to do everything myself this time. Spanish language was a problem, though. Family Masuda from the guest house Aconcagua helped me in any way from the arrangement of mule for carrying my stuff, and for getting a climbing permit application. Rather than the administrative assistance, the way they treated me like their family member touched me deeply. I thought it would be nice if I never have to leave Argentine. Maybe here I can find something I was looking for, something I can never find in Japan. The climbing itself—I could remember the high altitude acclimatization technique. Before I left Japan, I was advised to spend enough time acclimatizing in low altitude like 3000~4000m. I stayed long time in Confluencia along the approach, and Plaza de Mulas (4260m) where BC is located. However for BC and above, I just went to Nido de Condores at C1, and came down on the same day. 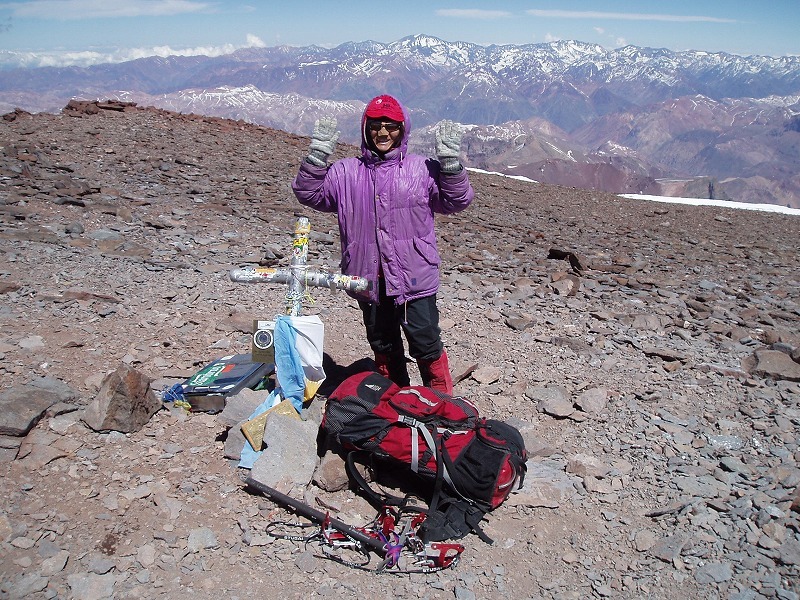 Next time, I carried a tent on my back, and started climbing to reach the summit of Aconcagua. My original plan was to stay a couple of nights at C1 /C2 and acclimatize. While talking with local porters and foreign climbers at the base camp, I realized there is a fine line between acclimatization and exhaustion. I changed my tactics to minimize the time spent at high altitudes and attack the mountain in one push. If the mountain is as high as 8000m, I would have to acclimatize my body to the height of 6000m and 7000m. Aconcagua is 6959m however, and I could reach the summit and come back down safely before I was really tired. I can’t say this tactics is always right, because it depends on each individual. In my case, this tactics worked, but I suffered from edema afterwards at the base camp. The crux of the route to the top was the last 100m ~ 200m below the summit where I had to climb in the thin air. The crux of a high altitude mountain climbing is really high altitude itself. After I passed 6500m altitude, I had difficulty lifting my legs. Walk 10 steps, stop and catch my breath and repeat this process. Look up at the summit many times. I think of my husband. He made this difficult climbs dozens of times and I realize once again my beloved husband was a great guy. I scattered ashes of my husband at the summit. The wind blew and carried the ashes to the Andes. At that moment, I felt really good about climbing the Aconcagua. Standing on the top of the mountain just like my husband did before, I felt my husband helped me climb this mountain. My Aconcagua climb in 2005 was more like a sentimental journey rather than a mountain climbing. But I had many wonderful encounters with people, and that is the essence of life. My husband and I often talked about mountain climbing when he was still alive. I remember once he told me, "Sue, you should pursue your own climbing, rather than supporting my climbing." " I will climb mountains for myself, in my own style." I said to myself, standing on top of the windy Aconcagua.